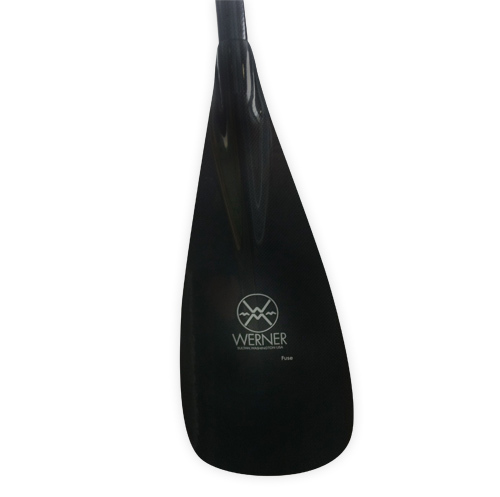 The Werner Fuse Stand Up Paddle is considered the big brother of Werner's previous success the Nitro. 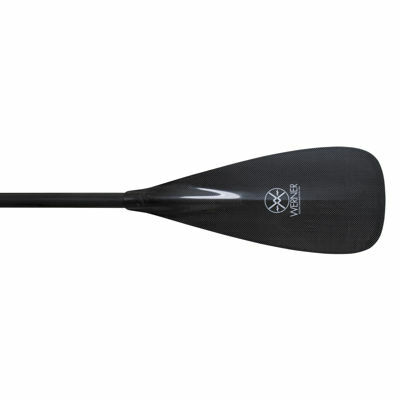 By utilizing a larger blade (19.5 inches by 8.25 inches), the Fuse is tough, buoyent and slick, and is the perfect choice for experienced larger paddlers who are looking for an effective and diverse stand up paddle. This paddle will take on the water with power, whether you are surfing, in flatwater or white water. Conditioned paddlers will find that the blade allows for powerful, efficient strokes. The carbon fiber blade has a foam filled Performance Core, which allows for the paddle to be dependable, light and long-lasting. The paddle also features a palm-style grip for maximum comfort and control. The Werner Fuse is also symmetrical, and measures out to 110 square inches. Werner recognizes that Ultimate Paddle Performance sounds like an idea marketed to experience paddlers, but believes that paddlers of all ages and levels of experience can benefit from a fitting and balanced paddle. Having the paddle that's just right for you will inevitably mean you feel comfortable, energized, excited and prepared for the adventure ahead of you. Werner's mission and promise is to create the Ultimate Paddle Performance, by utilizing advanced designs and incredible passion and energy to create the best fit for customers. The attempt to encompass the Ultimate Paddle Performance through their paddles does not stop at creating dynamic blade design and light weight construction . It also includes constructing comfortable grips, maintaining a tough durability and perseverance, and pushing forward into innovative new territories like the newly patented Adjustable Ferrule System.